GC Immigration Working Group: Hector Cordero Guzman, Ph.D.
Hector Cordero Guzman is a Program Officer in the Economic Development Unit of the Asset Building and Community Development Program at the Ford Foundation. His work at the Ford Foundation focuses on supporting strategies that increase labor force participation and returns to work for people in the U.S. with marginal labor force attachment, including immigrants and first generation residents. Dr. Cordero-Guzman supports organizations, programs, strategies, and initiatives that improve the public policies and infrastructure for the delivery of workforce development training to low-income people, particularly racial and ethnic minorities, immigrants, and other marginal populations, by improving the availability and accessibility of resources to obtain marketable skills, connect workers to the labor market, and provide opportunities to hold sustainable wage employment and encourage upward mobility within the labor market. Prior to joining the Ford Foundation, Dr. Cordero-Guzman was a Professor at the School of Public Affairs and Chair of the Black and Hispanic Studies Department at Baruch College-CUNY. He also holds an an appointment as a Professor in the Ph.D. Programs in Sociology and Urban Education at the Graduate Center-CUNY. Dr. Cordero-Guzman received his M.A. and Ph.D. degrees in Sociology from The University of Chicago. Before joining Baruch College of the City University of New York, Dr. Cordero-Guzman spent six years as an Assistant Professor at the Robert J. Milano Graduate School of Management and Urban Policy at the New School University. 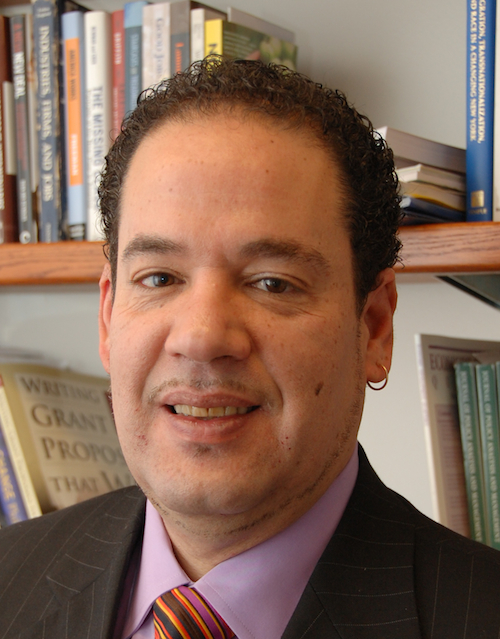 He also worked as the Research Director for Political Economy at the Center for Puerto Rican Studies at Hunter College of the City University of New York and as an adjunct instructor at Rutgers University in New Jersey. Over his career, Dr. Cordero-Guzman has collaborated and worked as a consultant to many government, research, and community based organizations including: the U.S. Department of Health and Human Services (ASPE and OCS), U.S. Department of Labor (ETA), The U.S. Department of Education, The White House Initiative on Educational Excellence for Hispanic Americans, The College Board's National Task Force on Minority High Achievement, The New York State Attorney General's Office (Civil Rights Division), New York City's Department of Youth and Community Development (DYCD), The Aspen Institute Roundtable on Comprehensive Community Initiatives, The Carnegie Endowment for International Peace, The Chapin Hall Center for Children at the University of Chicago, The Economic Development Assistance Consortium (EDAC), Fundacion Chana Goldstein and Samuel Levis, The Urban Institute, FLACSO (Facultad Latinoamericana de Ciencias Sociales) in the Dominican Republic, Red Internacional de Migracion y Desarrollo based in Mexico The Hispanic Federation, The Hispanic Association of Colleges and Universities (HACU), The South Bronx Overall Economic Development Corporation (SOBRO), Sunnyside Community Services, The Coalition for Asian-American Children and Families, The Committee for Hispanic Children and Families, and a variety of other groups and organizations.